In 1982 work began to develop a European standard for digital cellular voice telecommunications when the European Conference of Postal and Telecommunications Administrations (CEPT) set up the Groupe Spécial Mobile committee and later provided a permanent technical-support group based in Paris. Five years later, in 1987, 15 representatives from 13 European countries signed a memorandum of understanding in Copenhagen to develop and deploy a common cellular telephone system across Europe, and EU rules were passed to make GSM a mandatory standard. The decision to develop a continental standard eventually resulted in a unified, open, standard-based network which was larger than that in the United States. In February 1987 Europe produced the very first agreed GSM Technical Specification. Ministers from the four big EU countries cemented their political support for GSM with the Bonn Declaration on Global Information Networks in May and the GSM MoU was tabled for signature in September. The MoU drew-in mobile operators from across Europe to pledge to invest in new GSM networks to an ambitious common date. It got GSM up-and-running fast. In this short 38-week period the whole of Europe (countries and industries) had been brought behind GSM in a rare unity and speed guided by four public officials: Armin Silberhorn (Germany), Stephen Temple (UK), Philippe Dupuis (France), and Renzo Failli (Italy). In 1989, the Groupe Spécial Mobile committee was transferred from CEPT to the European Telecommunications Standards Institute (ETSI). In parallel, France and Germany signed a joint development agreement in 1984 and were joined by Italy and the UK in 1986. In 1986 the European Commission proposed reserving the 900 MHz spectrum band for GSM. The former Finnish prime minister Harri Holkeri made the world's first GSM call on July 1, 1991, calling Kaarina Suonio (mayor of the city of Tampere) using a network built by Telenokia and Siemens and operated by Radiolinja. In the following year, 1992, saw the sending of the first short messaging service (SMS or "text message") message, and Vodafone UK and Telecom Finland signed the first international roaming agreement. Work began in 1991 to expand the GSM standard to the 1800 MHz frequency band and the first 1800 MHz network became operational in the UK by 1993. Also that year, Telecom Australia became the first network operator to deploy a GSM network outside Europe and the first practical hand-held GSM mobile phone became available. In 1995, fax, data and SMS messaging services were launched commercially, the first 1900 MHz GSM network became operational in the United States and GSM subscribers worldwide exceeded 10 million. In the same year, the GSM Association formed. Pre-paid GSM SIM cards were launched in 1996 and worldwide GSM subscribers passed 100 million in 1998. In 2000 the first commercial GPRS services were launched and the first GPRS-compatible handsets became available for sale. In 2001 the first UMTS (W-CDMA) network was launched, a 3G technology that is not part of GSM. Worldwide GSM subscribers exceeded 500 million. In 2002 the first Multimedia Messaging Service (MMS) were introduced and the first GSM network in the 800 MHz frequency band became operational. EDGE services first became operational in a network in 2003 and the number of worldwide GSM subscribers exceeded 1 billion in 2004. By 2005, GSM networks accounted for more than 75% of the worldwide cellular network market, serving 1.5 billion subscribers. In 2005 the first HSDPA-capable network also became operational. The first HSUPA network launched in 2007. (High-Speed Packet Access (HSPA) and its uplink and downlink versions are 3G technologies, not part of GSM.) Worldwide GSM subscribers exceeded three billion in 2008. The GSM Association estimated in 2010 that technologies defined in the GSM standard serve 80% of the global mobile market, encompassing more than 5 billion people across more than 212 countries and territories, making GSM the most ubiquitous of the many standards for cellular networks. 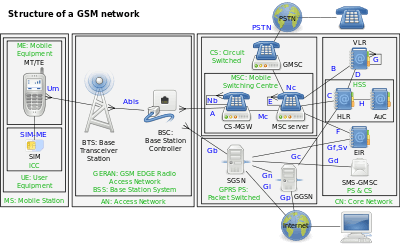 Note that GSM is a second-generation (2G) standard employing Time-Division Multiple-Access (TDMA) spectrum-sharing, issued by the European Telecommunications Standards Institute (ETSI). The GSM standard does not include the 3G UMTS CDMA-based technology nor the 4G LTE OFDMA-based technology standards issued by the 3GPP. Telstra in Australia has shut down its 2G GSM network on December 1, 2016, which makes it the first mobile network operator to decommission a GSM network. The second mobile provider planning to shut down its GSM network (on January 1, 2017) is AT&T Mobility from the United States. Singapore will phase out 2G services by April 2017. GSM is a cellular network, which means that cell phones connect to it by searching for cells in the immediate vicinity. There are five different cell sizes in a GSM network—macro, micro, pico, femto, and umbrella cells. The coverage area of each cell varies according to the implementation environment. Macro cells can be regarded as cells where the base station antenna is installed on a mast or a building above average rooftop level. Micro cells are cells whose antenna height is under average rooftop level; they are typically used in urban areas. 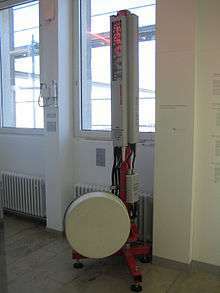 Picocells are small cells whose coverage diameter is a few dozen metres; they are mainly used indoors. Femtocells are cells designed for use in residential or small business environments and connect to the service provider’s network via a broadband internet connection. Umbrella cells are used to cover shadowed regions of smaller cells and fill in gaps in coverage between those cells. Most 3G networks in Europe operate in the 2100 MHz frequency band. For more information on worldwide GSM frequency usage, see GSM frequency bands. GSM has used a variety of voice codecs to squeeze 3.1 kHz audio into between 6.5 and 13 kbit/s. Originally, two codecs, named after the types of data channel they were allocated, were used, called Half Rate (6.5 kbit/s) and Full Rate (13 kbit/s). These used a system based on linear predictive coding (LPC). In addition to being efficient with bitrates, these codecs also made it easier to identify more important parts of the audio, allowing the air interface layer to prioritize and better protect these parts of the signal. As GSM was further enhanced in 1997 with the Enhanced Full Rate (EFR) codec, a 12.2 kbit/s codec that uses a full-rate channel. Finally, with the development of UMTS, EFR was refactored into a variable-rate codec called AMR-Narrowband, which is high quality and robust against interference when used on full-rate channels, or less robust but still relatively high quality when used in good radio conditions on half-rate channel. One of the key features of GSM is the Subscriber Identity Module, commonly known as a SIM card. The SIM is a detachable smart card containing the user's subscription information and phone book. This allows the user to retain his or her information after switching handsets. Alternatively, the user can also change operators while retaining the handset simply by changing the SIM. Some operators will block this by allowing the phone to use only a single SIM, or only a SIM issued by them; this practice is known as SIM locking. In some countries (e.g., Bangladesh, Belgium, Brazil, Chile, Germany, Hong Kong, India, Iran, Lebanon, Malaysia, Nepal, Pakistan, Poland, Singapore, South Africa, Thailand) all phones are sold unlocked. The development of UMTS introduces an optional Universal Subscriber Identity Module (USIM), that uses a longer authentication key to give greater security, as well as mutually authenticating the network and the user, whereas GSM only authenticates the user to the network (and not vice versa). The security model therefore offers confidentiality and authentication, but limited authorization capabilities, and no non-repudiation. Since 2000, different efforts have been done in order to crack the A5 encryption algorithms. Both A5/1 and A5/2 algorithms are broken, and their cryptanalysis has been considered in the literature. As an example, Karsten Nohl developed a number of rainbow tables (static values which reduce the time needed to carry out an attack) and have found new sources for known plaintext attacks. He said that it is possible to build "a full GSM interceptor...from open-source components" but that they had not done so because of legal concerns. Nohl claimed that he was able to intercept voice and text conversations by impersonating another user to listen to voicemail, make calls, or send text messages using a seven-year-old Motorola cellphone and decryption software available for free online. New attacks have been observed that take advantage of poor security implementations, architecture, and development for smartphone applications. Some wiretapping and eavesdropping techniques hijack the audio input and output providing an opportunity for a third party to listen in to the conversation. ↑ "GSM Global system for Mobile Communications". 4G Americas. Retrieved 2014-03-22. ↑ "2G Sunset" (PDF). ATT Mobility. Retrieved 10 August 2016. ↑ Owano, Nancy (27 Dec 2011). "GSM phones -- call them unsafe, says security expert". Archived from the original on 27 Dec 2011. Retrieved 27 Dec 2011. Nohl said that he was able to intercept voice and text conversations by impersonating another user to listen to their voice mails or make calls or send text messages. Even more troubling was that he was able to pull this off using a seven-year-old Motorola cellphone and decryption software available free off the Internet. ↑ "cPanel". Infosecurityguard.com. Retrieved 30 August 2010.